I picked up Morning Glories Volume 1 pretty much as an impulse buy. I saw it sitting by the counter and remember reading somewhere that it was a good read, so decided to pick it up. The review I read was that it was like tv’s Lost. After reading the first collection, I’d have to agree. I really enjoyed reading it, but much like Lost, I have no idea whats going on. There’s lots of mysteries going on that makes me want to read more. 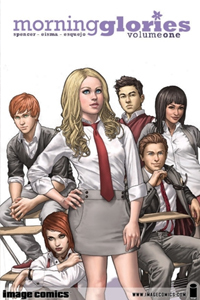 The story revolves around 6 students that have been accepted by a prestigious prep school. After arriving at their new school, they learn that they all share a strange connection and the school is really a front of something more sinister. With no outside help coming to help them, the students clash with their ‘teachers’ as they try and find a way out. I thought it was definitely worth the read, what are everyone’s thoughts?